Beerlao & Fried Seaweed Combo, please! I have never been a big fan of beer. Well, maybe not so true. On a hot day, I do enjoy a tall refreshing shandy or a bottle of fruity beer, like Mango, Kriek or Peach. But does that really qualify as beer? I don’t think the purists would agree. Beer drinkers may object to the words “Sugary and Sweet,” it could tarnish the image. 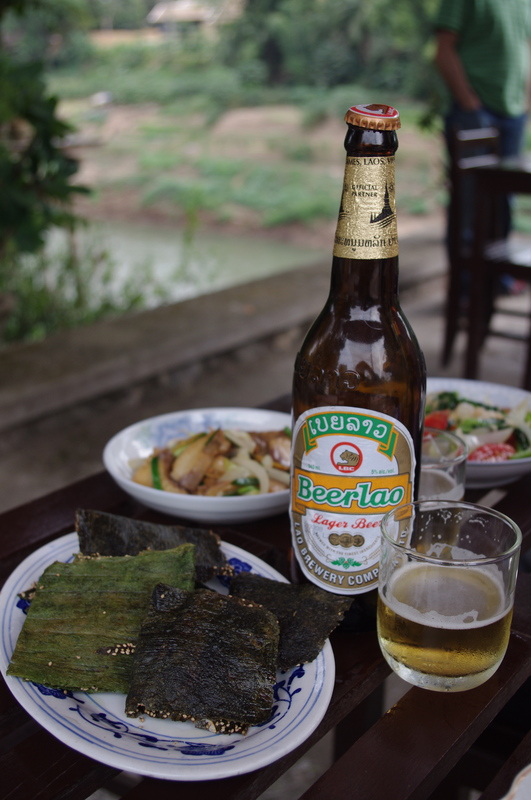 Before we left for our trip, friends that had previously visited Laos, raved about the country’s fermented brew-Beerlao. Many claimed it was THE best beer in the world. Ok, whatever, beer is beer, right? I live in Prague, the Czech Republic- a country well-known for its beer. If I couldn’t appreciate the third most popular beverage after water and tea here, how could I do that elsewhere? Luang Prabang, Laos. One of the most gorgeous cities I have ever seen. The city is surrounded by two bodies of water, the Mekong and Khan Rivers. It was home to the spiritual retreat of the Royal Family, therefore Buddhist temples are found at every other corner like Starbucks in any cosmopolitan city. 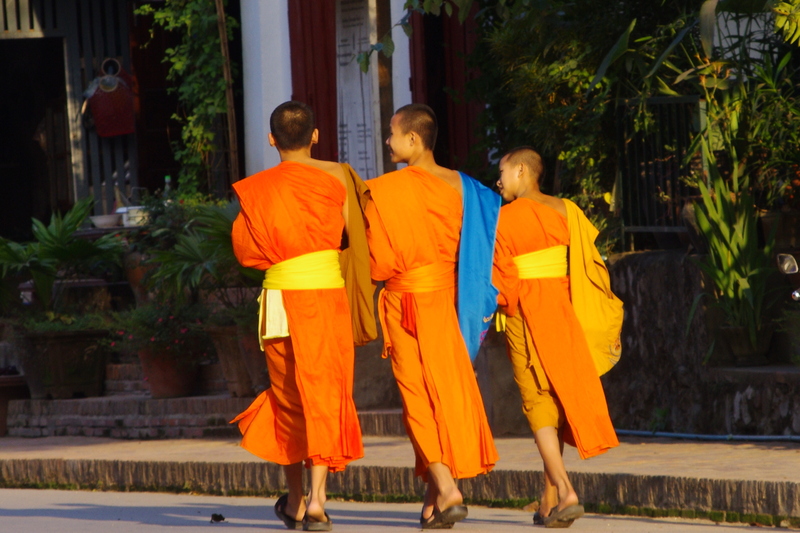 With temples and lots of them, come plenty of monks strolling the streets in flowing saffron-colored robes. My husband and I wondered if there might have been some historical intention for choosing this blazing orange color. The dramatic contrast of the draperies against Luang Prabang’s luscious green hilly background had a breathtaking effect. After we settled into our guesthouse and swapped our winter wear for something more suited to the city’s sunny and pleasant temperatures, we headed to town. With one main road, and a few side streets we quickly familiarized ourselves with the town’s layout. The central avenue consisted of restaurants, shops and foot massage stalls that catered to tourists. We decided to break away and lose ourselves in the village’s natural beauty. 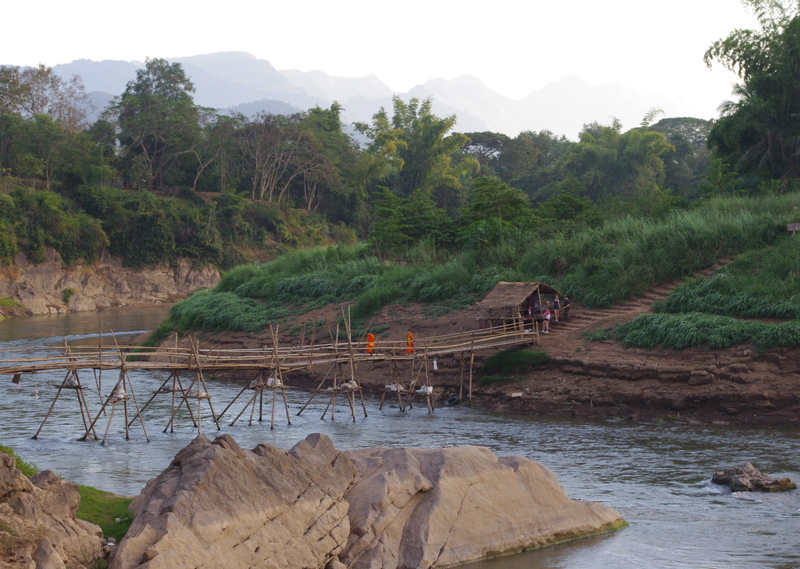 We veered off to the right and trekked along the river bank. Not too long after wards, our stomachs began yearning for food. Fortunately, there were some local restaurants along the river border to rescue us. We came upon a balcony filled with white plastic tables and chairs overlooking the Khan river. We noticed that there were several native residents dressed in their hotel uniforms taking their lunch break. We didn’t think twice and headed for the nearest vacant outdoor patio furniture set. Basking in the Southeast Asian warmth, we were extremely thankful to get a break from the gray cold winter we left behind. After all that traveling and walking, it was time to have our first Beerlao. The waitress took our drink orders and then it was back to figuring out what else to order. Discovering Lao cuisine was going to be exciting! Glancing at the menu, the words FRIED MEKONG RIVER SEAWEED grabbed my attention. Fried Seaweed? I wondered how different that could be from roasted seaweed, (just happens to be one of my favorite low-calorie snacks) But, hold on… fried seaweed? I had to feed my curiosity and order it. Our refreshingly cold 640 ml bottle of Beerlao arrived in moments. The beer was sold in two volumes. One could either choose a quart(640 ml) or a pint (330 ml). The sizes seemed peculiar to my husband. The waitress poured our beer into glasses that looked better suited for serving whisky. It felt strange not to have my fingers wrapped around the handle of a beer mug. Toast, “clink,” sip…it finally felt like we were on vacation. Hold on, did I say a sip? I downed that delicate glass of beer, a feat I have never before accomplished. On the rare occasion where I have ordered one with a meal, I’ll leave with my glass still half full. Was I thirsty? Was it the beautiful landscape that swept me away? Was I in fact enjoying a beer for the first time? As my husband poured me another, our waitress had returned with our food. 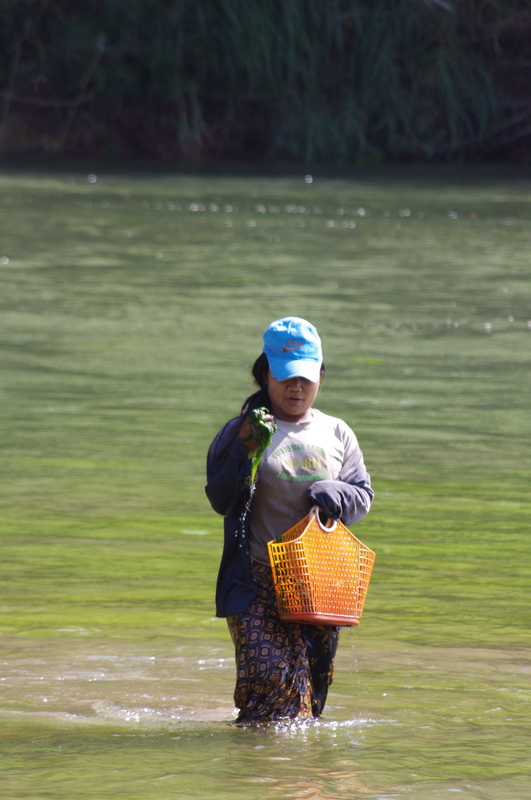 Sitting before us were a few folded rectangular pieces of evergreen Mekong River Weed. Glistening from its bath of oil, we noticed some of its other ingredients. Pressed into the thin layers were slivers of garlic, thin slices of tomato skins and sprinkles of white sesame. I looked at my husband, raised my eyebrows, shrugged my shoulders and reached for a piece. As I dipped the leaf into the side of curry paste, I noticed it was still warm and firm enough to pick up the spicy topping. “CRRRUNCH” were the sounds of my first bite. As I continued to eat, my other hand tried to catch the crispy flakes of seaweed that were unexpectedly falling below my chin. The thin brittle texture surprised us, as did the flavor. There was nothing overpowering about its taste, it was neither smoky or fishy. I could sense the flavor of the oil, but the seaweed itself was subtle. In fact, I think the part I enjoyed about eating it was its crispness. The cold refreshing beer and the crunchy strips of weed complemented one another for a fine first act. Now, here comes the hardest part. How does one describe the taste of beer? In my opinion, Laos’ national ale had a very light flavor, similar to a Pilsner. However, there was something more refreshing and appealing about it but, I couldn’t yet distinguish why. When we got back, I told my parents all about our trip. With my father, I went into great detail about my positive beer experience. (My dad has a knack for shooting off random facts at any given time, connecting bits of trivia to discussions.) And as I was telling him about my impressions of Beerlao, he went off on a tangent and began discussing the production of beer. 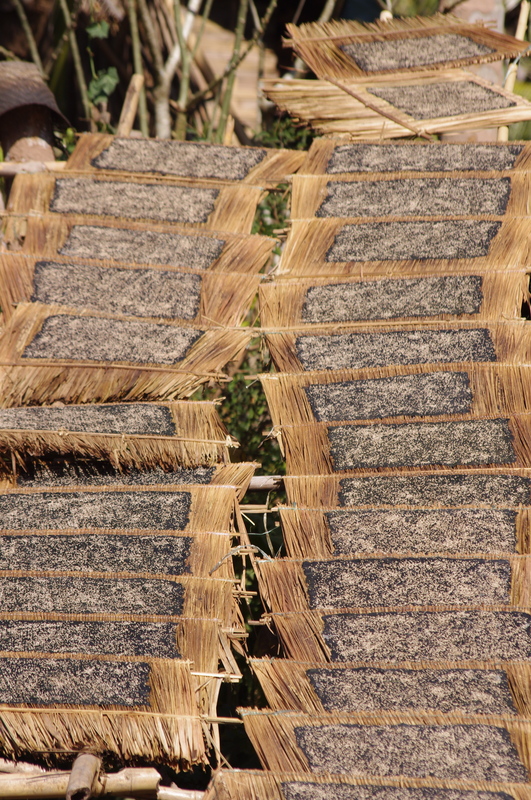 From him, I learned that rice is one of the ingredients used to make most Asian beers. Huh? Curious to know more, I did some research and soon discovered that besides using malt, the other main ingredient in this golden lager was indeed- jasmin rice! I heard about rice wine, but beer? Those grains that nourished me throughout my childhood were being used to produce beer? It made me think about chef Marcus Samuelson’s quote “So much of cooking and eating is about where do we want to go in our memories.” I wondered if those first few sips had awakened my taste buds and caused my brain cells to travel to a familiar and cozy place in my personal history? Maybe I needed a brew with a link to the first flavors of my youth to finally enjoy it or maybe, I would just never be a fan of beer.